Alfreton Road is flanked on both sides by Turkish restaurants, I wanted to visit one of them but how do you chose between them!? In the absence of a blog to consult on such specific matters I went for the most flashy. 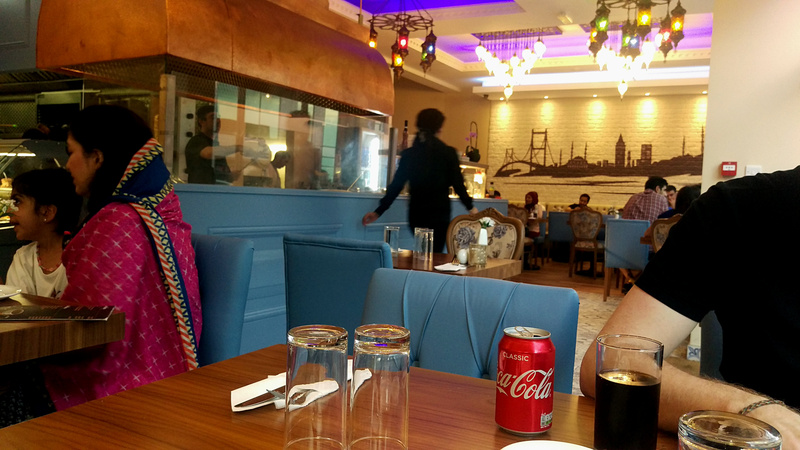 The Bosphorus catches the eye, big windows, bright new interior and a man visibly hard at work on their open grill. With plenty of seating upstairs it is pretty spacious and they were busy on a Wednesday night, sending out lots of food for delivery too. The menu is more interesting and diverse than I might have imagined. It has the kebabs and grilled meats you would expect but also chefs specials and “Turkish Pizza”. If you journey down at the 11am opening time you can also enjoy a buffet breakfast, though I couldnt find out exactly what this included. We decided to share a couple of hot mezze starters but before they arrived some complimentary bread arrived. A nice touch that was unexpected and very tasty. Some research leads me to believe the bread was a type of pide which can also be stuffed pizza – but I could very well be wrong. After the high of the bonus bread we were somewhat bought back down to earth by the starters. We had some Sigara Borek and Sucuk, minced lamb in filo pastry and garlic sausage respectively. The presentation was simple to say the least, particularly with the sausage. It was passable. A nice texture and a little kick of flavour, at £4 I suppose I shouldn’t expect too much more… however a pound more did not afford an improved experience with the meaty pastry. 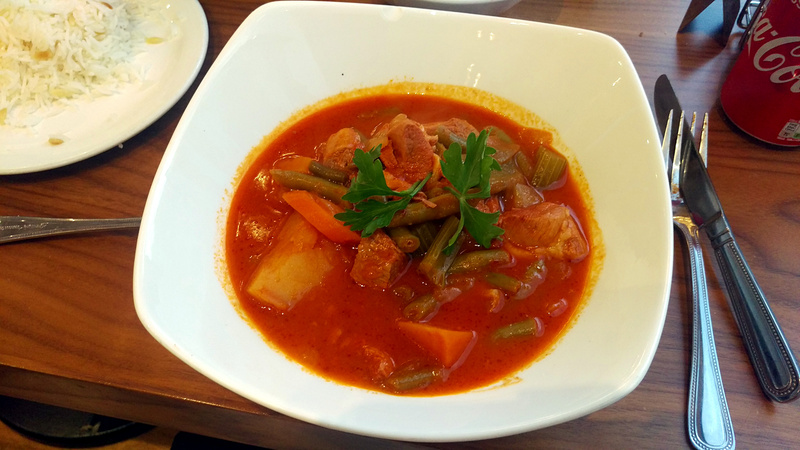 It just didn’t taste of anything, no seasoning or Turkish spices that were discernible. Far inferior to the Arayes, a similar item at Marrakesh. I had gone in with the intention of having a bit of grilled meat with some token salad but the lure of a chefs special proved too much. Guvec Lamb got my final vote, the meat sauteed with seasonal vegetables. It didn’t arrive looking as I expected, the “sauteed” had suggested, in my mind, something fried… but a stew was basically what ended up in front of me. The seasonal vegetables themselves weren’t quite what I expected, July/August rarely role round to the thought of “get me some carrot and celery”. The lamb was tender, stewed for quite a while but hadn’t been cooked with any particular spice to elevate it above home cooked. The base of the stew was fundamentally tomatoes (and if I was feeling rude could compare it to a famous tin of soup). It was hearty, autumnal fare, that was filling and warming certainly, but I struggle to think of anything else nice to say about it. I was looking forward to my meal at the Bosphorus, there was a buzz about it when we arrived that only served to heighten expectations. Whilst I was the victim of an ambitious and unknown menu choice the starters did little for their case. I could have just had my main and gone home pretty full for £11.50, which isn’t bad for a lamb dish, but I can think of a lot of places I would rather spend that money. Perhaps their kebabs would be a better choice but I don’t think I’ll be back to find out. Someone on Twitter commented that Istanbul, formerly called Han Sofrasi, a few doors down is better. A Turkish comparison may be on the cards.